Have you succeeded in sticking to your New Year resolutions? Here’s how Hypnotherapy and NLP can help to keep yours! One of the hardest parts of sticking to a New Year’s resolution is stopping old habits that we’ve had for ages. We more often than not go into the New Year with the best intentions of bettering ourselves and find we fail rapidly. If you have a whole string of things that you want to change it can just be too hard and lead you to fail at all of them. Trying to lose weight is hard enough without adding cutting down on smoking and exercising more at the same time. If you have several New Year’s resolutions it is crucial to give yourself realistic goals. Select what is the most important thing you want to improve, be realistic and really concentrate on making it work. It is most likely that success in one area will give you confidence and trigger you to then pursue further changes. Hypnotherapy and NLP are perfect tools for sticking to resolutions. As we utilise our conscious mind to focus on and achieve a change or goal. However, really ingrained negative practices are formed and saved in the subconscious part of the mind, which is the part of the mind that NLP and Hypnotherapy can reach without difficulty. So, even though we are telling ourselves that we do not need to smoke, our subconscious mind still holds on to the old behaviours that it has done for years. The subconscious is much stronger than the conscious that’s why we need to ask its permission. That’s where Hypnosis comes in. In very simple terms, our subconscious is like a seven-year-old child who just wants to seek out pleasure and avoid pain even if this means continuing old habits that no longer serve us over new ones. As it has no idea if they will work, it would rather keep you overweight and sad than take a risk of being healthy and happy if that’s all it knows how to do. Are you familiar with the phrase “the definition of insanity is repeating the same behaviours and expecting a different result”? 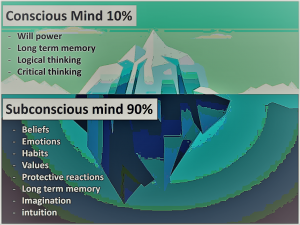 This is how our subconscious mind works! There is another area NLP can particularly help if you find yourself self-sabotaging e.g. you have an amazing opportunity such as a new job or a great date but you just can’t get over your fear of failure to actually show up and pursue it. This is a limiting belief which NLP can have very fast and lasting results to remove these thoughts and obstacles to allow us to live much more fulfilling lives. With NLP and Hypnotherapy, we can find new ways for you to gain access to your subconscious and seek out root factors that cause negative habits that you want to transform. Once the supporting beliefs are discovered and transformed we can assist you to make the necessary changes. So the strength to become successful with New Year’s resolutions then comes from both our conscious and subconscious, which is especially powerful. If you’re planning on making self-improvements this year, treat yourself to some hypnotherapy to give you the best chance of achieving them. Make sure you have the tools to be successful and visit us at Greenwich Wellness Rooms.